the barren and windswept high plains come to an abrupt halt about 25 miles away. reaches high into the cobalt sky. 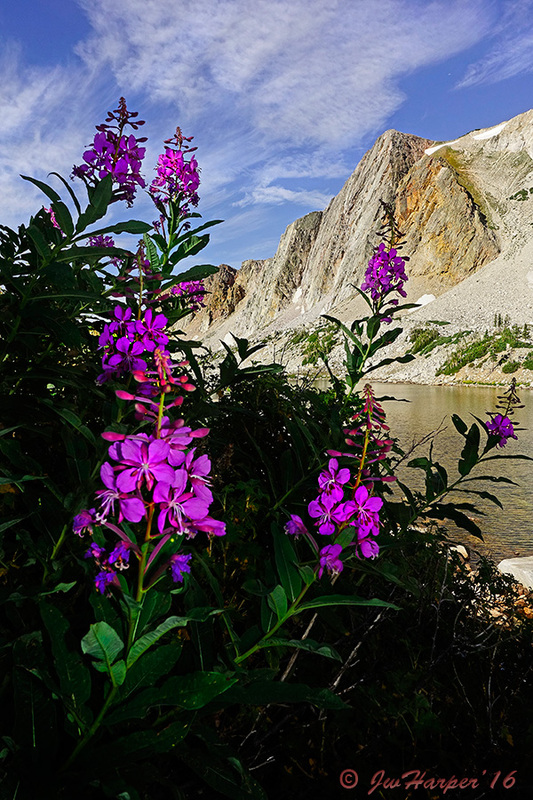 This is extraordinary, pristine alpine high country with a colorful history well worth exploring. 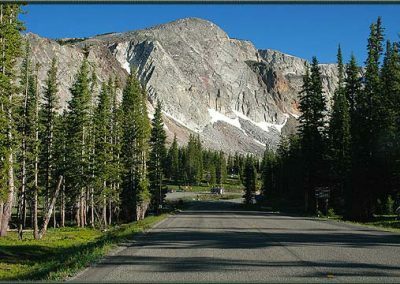 The “Snowies” are a part of the Medicine Bow-Routt National Forest and much of this captivating area has been designated as a Scenic Byway (*Note: good info and links are found here). 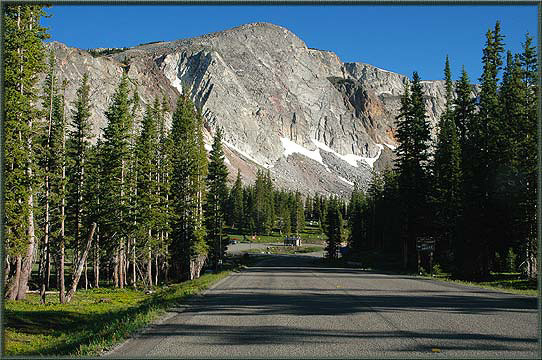 As the quaint town of Centennial (WY) is left behind, one traverses across Snowy Range Pass (10,840′) and a stunning picture postcard comes alive. 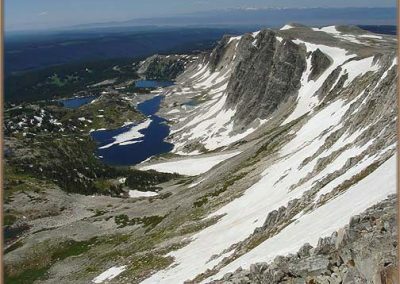 From the high point, Medicine Bow Peak at 12,031 feet, a series of rock faces, the Southeast Faces of the Snowy Range progress in a southwesterlydirection. The Faces are tilted upright like huge defensive plates of Stegosaurus armor and separated from each other by snow-choked couloirs. 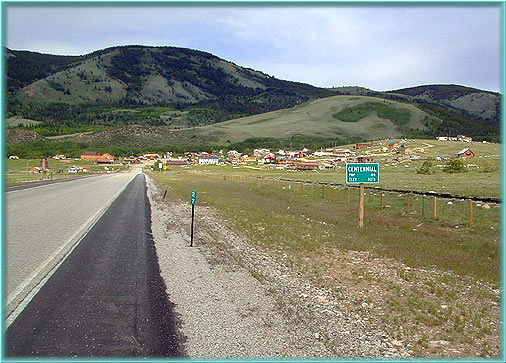 To the WEST of this high ridgeline, the land gradually declines into densely forested hills punctuated with occasional lakes, aspen groves and subalpine meadowlands for nearly 30 miles in the direction of the historic towns of (Grand) Encampment and Saratoga (the fishing capital of the Cowboy State). To the EAST however, there is a sheer drop of at least 300 to over 1,100 feet into an aesthetic collage of snowpack, talus slopes, tundra meadows, scattered lakes sparking like gemstones and gurgling streams, all surrounded by strong stands of Englemann Spruce and other less populous fir, pines and aspen depending on altitude. Here, wildflowers literally explode during the foreshortened summers, decorating the high meadows like an impressionist’s canvas. The scene is nothing short of spectacular, as is the opportunity for climbing (see below for routes and beta), hiking, camping and fishing. Here are some shots in and around Centennial’ (WY), population 100 or less, the ‘eastern gateway’ to the “Snowies” on Highway 130. 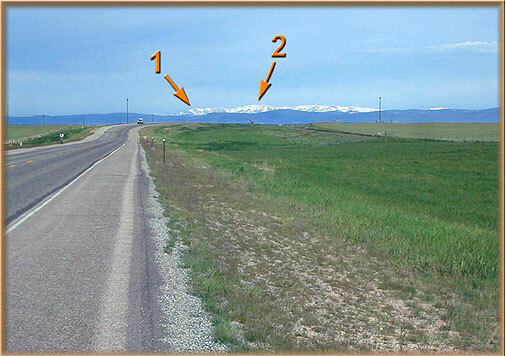 The first shot is about 10 miles out (east of town, looking west), and one can see the Southeast Faces (1) as well as Medicine Bow Peak (2) from this vantage. 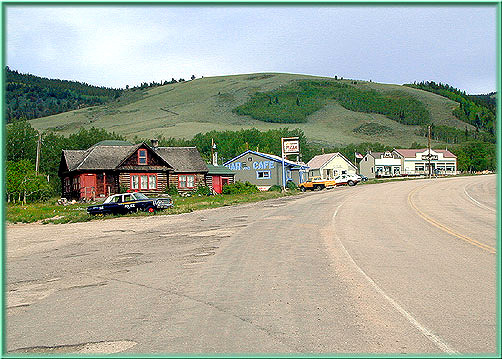 The second shot is approaching the town, third is in town. 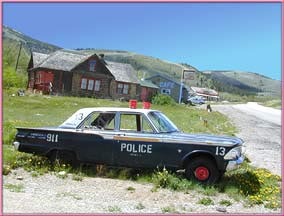 Judging from the state of the police car, coffee can emergency lights and all, it is pretty rural territory. Stop in here – there are some very nice, old fashioned hotels, visitors amenities and friendly people found in this historic little mining town. 1.) Look at the Snowies Map for a GENERAL OVERVIEW of the area. 2.) Go to the TERRASERVER WEBSITE for a satellite view of the SNOWIES. Click on the image to focus down on the detail…. COOL !! 3.) 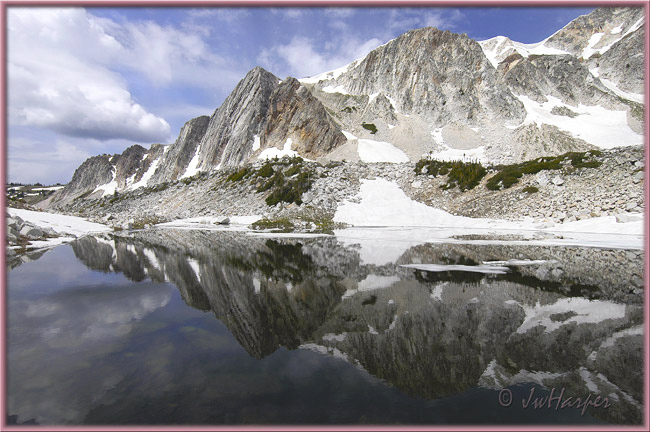 Go to our books page for additional reading on the SNOWY RANGE. SEE MORE SNOWY IMAGES HERE!! 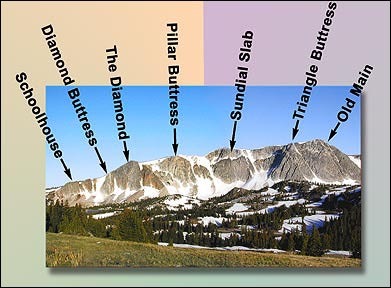 This is a first attempt at a map showing detail of the features found in the Snowy Range, particularly in the area of the Southeast Faces. There are many more trails east of the Libby and Lewis Lake area. This map is a ‘takeoff’ of a rather new, outstanding USFS map placed near the Med Bow Peak Trailhead at the Lower Lake Marie Parking Lot (2005). It is in no way complete. If you get to the map posted at the Trailhead, check it out. Hopefully the Forest Service will make smaller copies of their work available in the future. The core of the Snowy Range is a very ancient granitic upthrust, some 2.5 billion years old, that penetrates the earth’s crust. Geologic structures of this age are rare and are found in only a few other places on earth, most notably in the Witwatersrand Basin of South Africa. 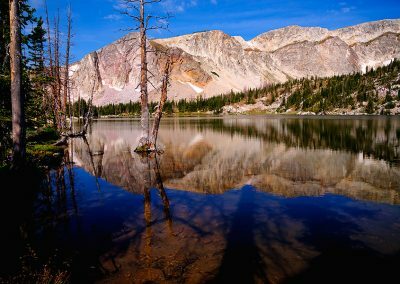 The major mountain-forming event, the Laramide Orogeny, began about 100 million years ago and as a result, the Medicine Bow Mountain Range rose thousands of feet above the nearby basins. Consequently, at higher altitudes, one finds an interesting mix of extremely hard quartzite granite filigreed with cracks and seams, sometimes jumbled together with much younger, darker Postcambrian sediment. Then later, during the Pleistocene Era (1.6 million to just 10,000 years ago), glaciers formed and slowly wandered downwards from the higher elevations, leaving behind a highly carved up landscape in their wakes. Rubble fields and moraines found at the base of the range are remnants of these “ice monsters”, seen especially as one approaches the small town of Centennial from the east today. To mention the Snowies in one breath is to mention the wild west, including early trappers, explorers and trailblazers in another. While a relatively small place, the Snowies constituted one of the major barriers to the western migration of early Americans. Because they were nearly impassable, especially during the extensive high country winters, the Overland Trail was forced further northward. Indians, railroads and timbering also played major roles in the history of the area. There were no less than five separate periods of feverish mining activity for precious metals here, culminating with the discovery of DIAMOND deposits in 1977. In the meantime, much of the history of Vedauwoo pertains to the Snowies as well. The climbing (as well as hiking and camping ) season is short in the Snowies: Mid-June to mid-September due primarily to weather conditions. Some push it beyond these limits, although expect more drastic weather changes if you do. Access to the range is mainly via State Highway 130 out of Laramie, and this road is opened each year BY SNOWPLOW just prior to Memorial Day Weekend. All of the Southeast Faces (see the labeled picture at the top of the next page) and many trails lie above 10,500 feet in altitude. Look at the “Snowies Map” to see the general layout of things. “Schoolhouse“, the rock face above Lake Marie, is the first of the faces to melt out completely. Nearly all of its routes are snow free by early May, but most people just can’t get here at this time – the entire area is mostly buried under deep snow as is the road. Steep snowfields and bergschrunds subtend the other formations for another few weeks, depending upon meltout. When you do get here, particularly if you are a climber, remember THIS IS SERIOUS ALPINE TERRITORY !! (check out the sign!!) Spontaneous rock fall, a natural hazard at this altitude, is heaviest in the first part of summer, and tends to peak around 9:00 AM. I have personally witnessed several rockfall injuries and 2 casualties…..it does happen! ALSO, severe afternoon storms are frequent and can move in very quickly and completely unexpectedly. Set your ‘barometric watch’ to signal alarms if the pressure begins to drop faster than normal and above all, STAY ALERT!! Check the weather ahead of time, but no matter what the forecast predicts, be prepared for rain, hail, snow, gale force winds and lots of lightning associated with the storms! Also please note, people die here by lightning strikes each year and such casualties form a part of the historic record. One person who apparently did not believe how severe weather conditions could be up here was the pilot of a United Airlines DC-4 who crashed high on the face just right of Sundial Slab, killing all 63 aboard in 1955. Rescue was impossible and parts of the plane can still be seen strewn down the slopes below the impact site. A monument commemorating the unfortunate victims of this catastrophe was placed at the Miner’s Cabin Turnout in the summer of 2001. So if a storm comes up quickly, seek shelter immediately no matter where you are, and DO NOT move around in the scree fields at this time. Beyond the exquisite beauty of this small alpine oasis, the Southeast Faces provide surprisingly accessible climbing for those intrepid enough to get on them. The route topos and descriptions seen on the next pages are similar to those in my article entitled “Diamonds in the Rough; Alpine climbing in southeast Wyoming” found in ROCK & ICE Magazine, Vol. 102, August/September 2000, pages 112 to 117. Most are complete, although some are lacking precise detail at present. Please consult the published information as well until all information can be consolidated here at this site. Thanks. 1.) Use at least a 60-meter pair for ropes when climbing here …. and a “standard rack” will do. 2.) WARNING …. WATCH OUT FOR LOOSE ROCK !! These routes don’t see much traffic, and there is considerable unconsolidated rock here!! ALWAYS WEAR A HELMUT !! The US Forest Service has invested considerable capital and manpower into trails and trail maintenance in this area. None the less, the use of these facilities remains fairly low – with certain obvious exceptions. 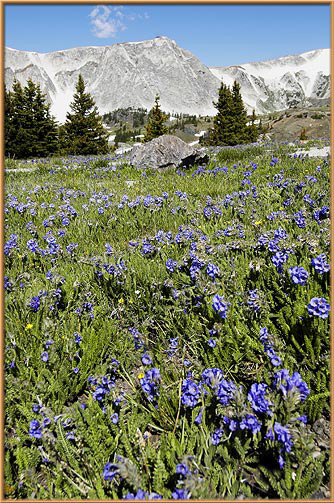 This is most fortunate because nearly all trails are at 10,000 feet in altitude and above and the flora and supportive underlayment are particularly fragile. Please be observant of these facts and treat this place with special care. 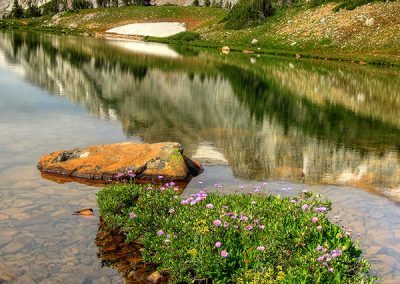 There are no less than 18 trails that thread throughout this remarkable ‘alpine mecca’ ranging from just 0.2 to over 8 miles in length. 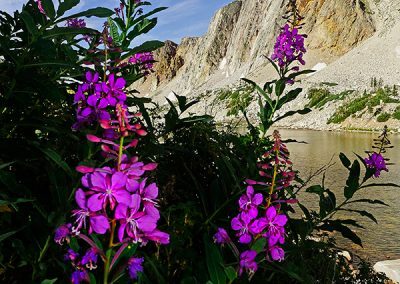 They access spectacular terrain as diverse as deep rocky canyons, flowery meadows, clear alpine lakes, stunning sheer rock faces and one of the highest points in the State. 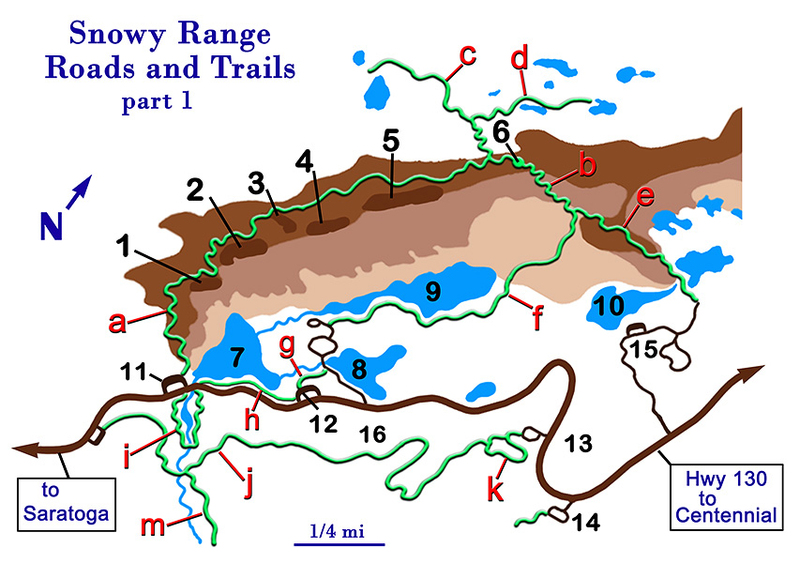 These trails are itemized, described and diagrammed in a small USFS Brochure entitled “Medicine Bow – Routt National Forest: Snowy Range Trails”. It’s rather hard to find. You might try calling the USFS Office in Laramie (307-745-8971) and try to locate one. Another ‘brochure’ that’s particularly helpful is the so-called ‘visitor’s Guide’. Ask for it – They will know what you are talking about…. * NOTES: -I’ll reproduce the “TRAILS GUIDE” here if I find the time. In the meantime – LOOK AT THE MAP FOUND HERE. -Below find a TRAIL LIST with minimal detail. *Remember, all of these trails are above 10,000 feet in altitude! Be prepared for all contingencies! *Remember, all of these trails are above 10,000 feet in altitude! Be prepared for all contingencies! -Below find a TRAIL LIST with minimal detail. *Remember, all of these trails are above 10,000 feet in altitude! Be prepared for all contingencies! 1.) 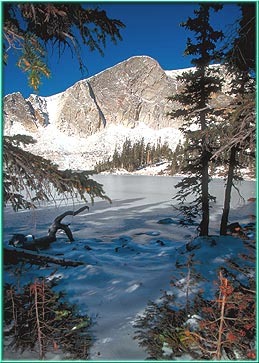 Heart Lake Trail (#101) 0.8 200′ Dipper Lake, Forest Road #103 Very scenic, west side of Med Bow Peak. 2.) 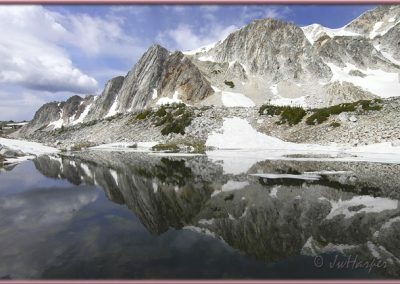 Quealy Lake (#102) 4.1 500′ Quealy Lake, Forest Road #103 Crosses subalpine terrain, 3 lakes, N of Med Bow ridge. 3.) Vagner Lake Trail (#103) 0.5 100′ Quealy Lake, Forest Road #103 Spur from Quealy Lake Trail to Vagner Lake. 4.) 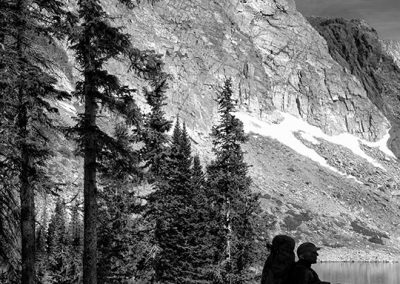 North Gap Lake (#108) 2.5 700′ Lewis Lake Trailhead Follows a gentle grade, several lakes, boulder fields. 5.) Shelf Lakes Trail (#109) 1.1 120′ Lewis lake Trailhead Scenic alpine trail, north side of Brown’s Peak. 6.) Lake Marie Falls (#290) 0.2 50′ Lake Marie, West Parking Lot Short scenic loop, So. French Creek, waterfalls. 7.) Silver Lake (#291) 1.1 280′ Silver Lake Trailhead Loop trail around lake, subalpine terrain, great views of rocks and creeks. 8.) Tipple (#293) 2.1 400′ Tipple Trailhead or Miner’s Cabin Trailhead Subalpine, great views of rocks and creeks. 9.) 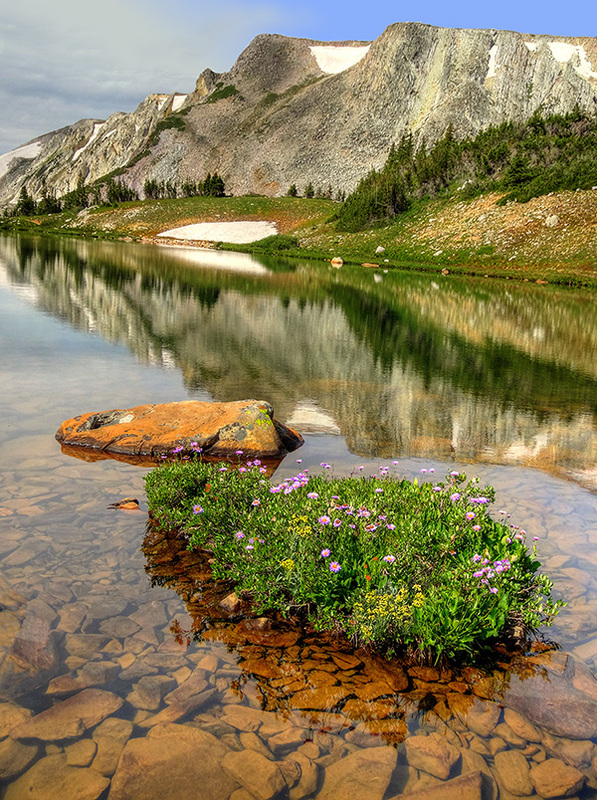 Dipper Lake (#294) 3.4 1400′ Dipper Lake, Forest Road #103 Passes lake and climbs steeply to Med Bow Peak. 10.) 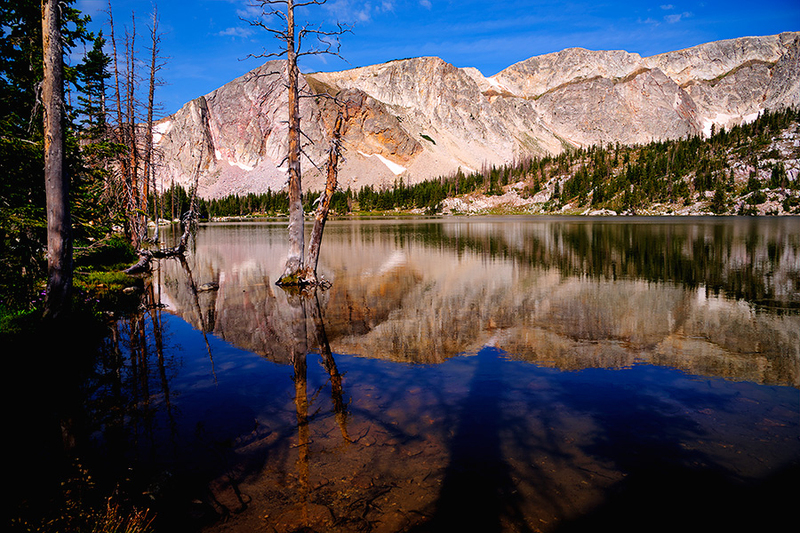 Medicine Bow Peak Trail , aka MBPT (#295) 4.5 1600′ Connects Lake Marie on the West to Lewis Lake on the East, surmounting MedBow Peak . Steep, open rocky alpine panoramas. Goes behind, west of, the Southeast faces. Very exposed during bad weather.. 11.) Lakes (#296) 1.8 900′ Mirror Lake Picnic Area. Open alpine past Lookout Lake, panoramas sheer rock faces, Med Bow Peak, and superb alpine terrain. Highly recommended. 12.) Meadow Falls (#297) 2.7 350′ Silver Lake Trailhead Loop Trail, subalpine, 600′ spur to waterfall. 13.) French Creek Canyon (#298) 5.3 1600′ Tipple or Miner’s or French Creek Superb, subalpine, meadows, canyon, etc. 14.) Lost Lake (#395) 3.5 180′ Lewis Lake or Brooklyn Lake Campground Subalpine thru meadows, streams and lakes. 15.) 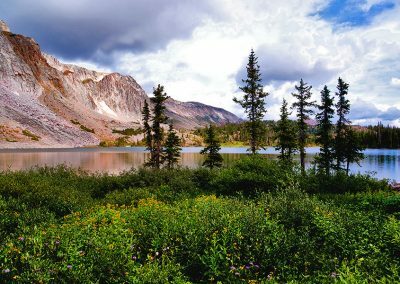 Deep Lake (#110) 0.5 200′ Sand Lake or Sheep Lake or Lewis Lake Access only from Quealy Lake Trail #102. 16.) Miners Cabin (#0.7) 0.7 200′ Med Bow Peak Overlook (off Hiway 130) A short, self-guided loop, historic mine, cabin, informative signs. 17.) 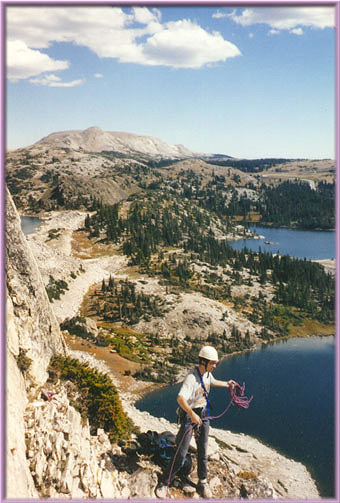 Sheep Lake (#8.2) 8.2 1300′ Sand Lake or Sheep Lake, Forest Road #317 High, flat subalpine open parks, lakes, streams. 18.) North Fork Trail (#390) 4.4 1300′ North Fork, Forest Rd #317 or N. Fk. Cmpgd. Follows L. Laramie River, fishing, biking. There is quite a large selection of campsites along/near Highway 130 as it winds over Snowy Pass. Unfortunately, the USFS changes the content of their website continuously, so for now, look at the Scenic Byway Map for established campgrounds. 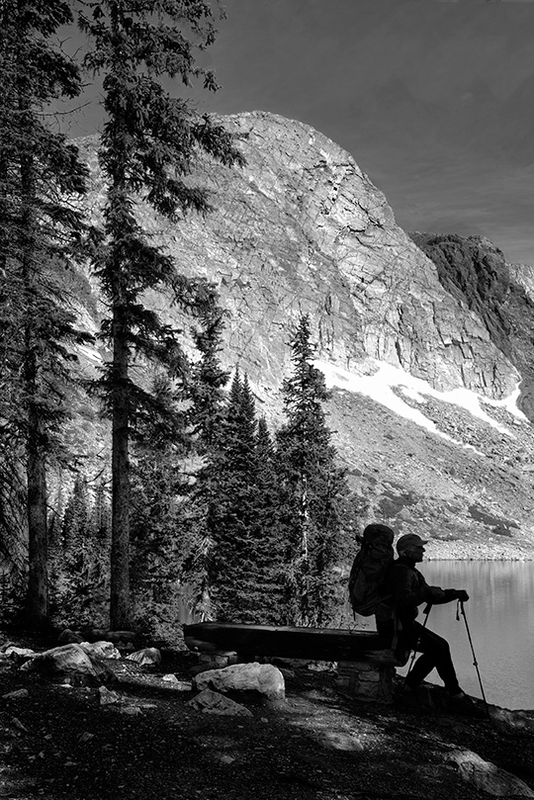 Look for the following Campgrounds: North Fork, Nash Fork, Libby Flats, Brooklyn Lakes, Sugar Loaf or Silver Lake. These are all fee-based campgrounds with minimal facilities, eg, tent sites, barbecue pits, picnic tables, heads, water, etc., although some do not have all of these. Camping is also allowed elsewhere as signage permits. Please LEAVE NO TRACE of your stay, as this is extremely fragile alpine terrain. In addition, there are a couple of guest facilities and private cabins for rent. -Chris and Michelle Borer own several rustic, very accommodating, snug cabins spread amongst pine trees and alpine flowers high on the mountain. Open year ’round, great hosts…. 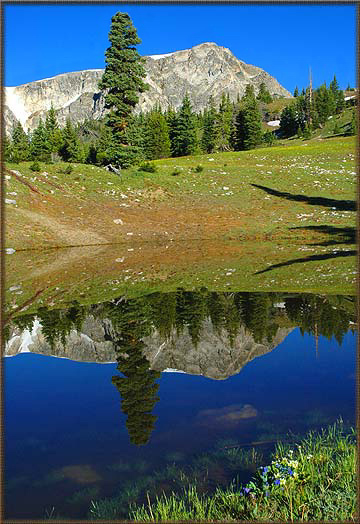 Mountain Meadow Cabins, PO 203, Centennial, WY, 307-742-6042. Lots of information from these kind people about summer and winter activities in the Snowies….